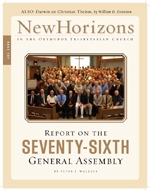 After forty-two years, the Seventy-sixth General Assembly of the Orthodox Presbyterian Church witnessed the completion of the work of what may be the longest-serving special committee in the history of the OPC: the Committee on Revisions to the Directory for Public Worship. While Calvinists celebrate the 500th anniversary of John Calvin's birth this year, secularists are celebrating the 200th anniversary of Charles Darwin's birth. On this occasion, let's examine Darwin's argument against Christian theism as stated in his autobiography.